There’s an unpredictability to Conor McPherson’s plays. You think you know where they’re going and then the audience is shocked by a sudden change of pace and style. His 2013 work, The Night Alive, has, oddly, not been performed professionally since its debut at the Donmar and award-winning Off-Broadway run later that year. But it has been revived, after much negotiation with the writer, by First Knight Theatre, and it opened at London’s Jack Studio Theatre on Thursday night. 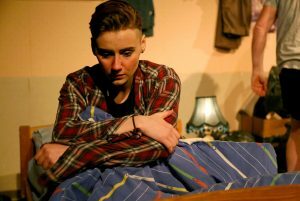 The Night Alive is a slow paced drama that follows the lives of four solitary people who have never had the breaks in life. They inhabit life’s underclass, scraping by with cash-in-hand deals and with little optimism that any of them will experience love, happiness or security. 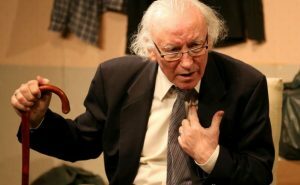 It is set in the ramshackle Dublin house of Uncle Maurice, a cantankerous old widower who skulks around the property criticising his slovenly lodger, Tommy, and masking his terror of ageing, loneliness and, worse, death, with open hostility. Tommy has been estranged from his wife and kids for the past two years and has returned to the man that helped raise him, Maurice, renting a bedsit in the house that is little more than a squat. There’s no fridge, occasional lighting and hot water provided by a recycled Euro, and bags of rubbish and clothes scattered around the room. It’s not much, certainly no home comforts. The 50-something gets by doing odd jobs for people aided by Doc, an endearing, slow-witted, amiable man, in a dirty tracksuit, who is grateful for the meagre wages that come his way. Their uncertain lives are disrupted when Tommy comes home one night with Aimee, a young prostitute he found after she had been beaten up by her boyfriend. Her unexpected intrusion into their lives has repercussions that none of them could have anticipated. “So are you a doctor?” she asks Doc, curious about his name. “Nah, it’s just short for Brian,” he answers and Tommy explains that Doc has a mild learning disability which makes him slow to process information. Eoin Lynch’s compelling turn as the affable Doc is a real highlight of this story about the lonely and vulnerable. His innocence and naivety is endearing and it’s beautifully under-played by Lynch who lets McPherson’s comical and razor-sharp dialogue do its work. But it is Howie Ripley’s riveting cameo as violent, abusive boyfriend, Kenneth, which elevates this uneven production. 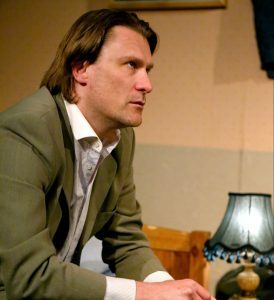 The play moves slowly during the first act with the writer subtlely revealing insights into his characters’ lives. Tommy is getting grief from his wife, Maurice is fretting about stolen turnips and Doc reveals, with a schoolboy snigger, the sort stress relief house-guest Aimee will provide for €40. Then Tommy and Aimee slip out to buy milk and Kenneth lets himself into the room, confronting a startled Doc. The atmosphere sizzles with electricity as the volatile and erratic intruder quietly sets about intimidating and, ultimately, terrifying, Doc. His reign of terror continues after the interval with Ripley giving a masterclass turn as an out-of-control psycho tormenting the petrified couple. 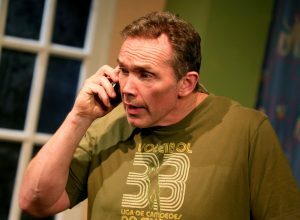 David Cox as Tommy, is at his best when coping with the endless phone calls from his wife over the behaviour of their teenage kids, but there are times when his voice lacks strength and confidence. McPherson’s deceptively jocular writing has a dark undercurrent that can simultaneously amuse and disturb. Director Dan Armour, as Maurice, appears a tight-fisted old git, but lets slip moments of generosity and benevolence. Bethan Boxall’s Aimee, a young woman trapped in a sadistic relationship and hopeless existence, is well observed. You hope that Tommy’s Good Samaritan act will signal an improvement in her life but she seems as incapable as the others of changing. 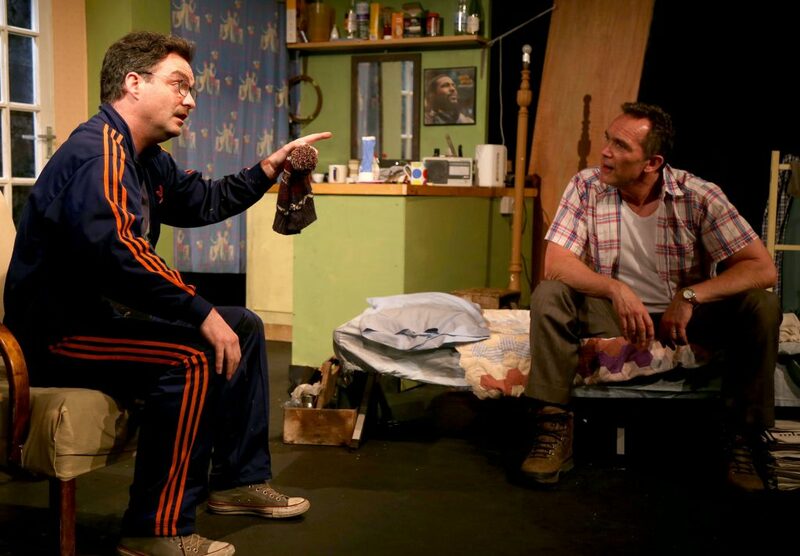 The Night Alive runs at the Brockley Jack until June 9.
Review: First Knight Theatre’s production of Conor McPherson’s The Night Alive captures the loneliness and vulnerability of Dublin’s singletons, with Eoin Lynch and Howie Ripley giving memorable performances.